Drink local with laser-cut topographic-map coasters of four iconic Pacific Northwest mountains. When you raise a glass of local brew, set it down on a coaster that’s hyper-local, too. 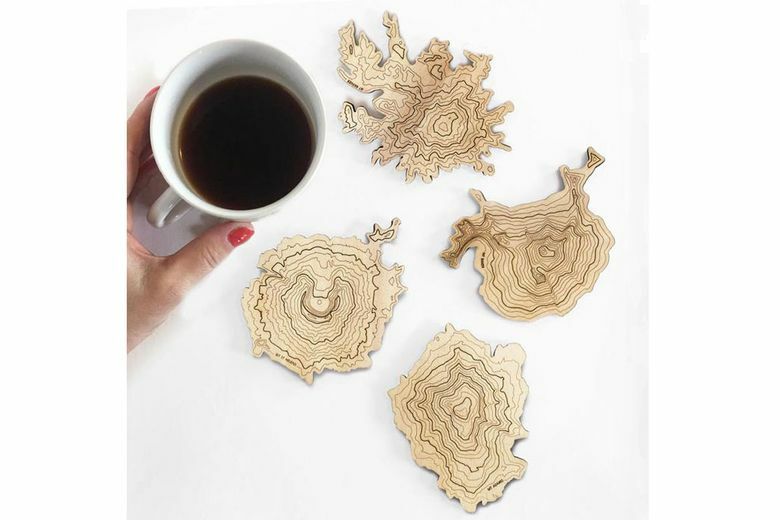 Design By SML’s Washington Volcanoes Topographic Coasters are accurate, laser-cut recreations of topographic maps of Washington’s most beloved and recognizable volcanic mountains. Rest your drink on Mount Rainier, Mount St. Helens, Mount Baker and Mount Adams, and inspire conversation and reminiscences of your favorite outdoor adventures. The artfully detailed coasters are made from sustainable poplar wood with felt backing and a clear matte finish. Each set, containing one coaster of each mountain, is made by hand in Seattle by the husband-and-wife design team SML, which stands for Simple Modern Living. Mossbacks, outdoor enthusiasts, geography nerds, fans of modern design — we’ll all drink to that.